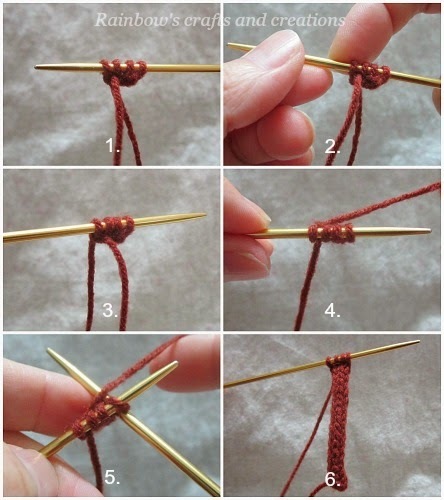 Usually, we use a simple knitting technique called I-cord to create a narrow tube of knitting on double-pointed needles. This is a stitch used for making handles on a knitted bag, as edging or embellishment on a project, ties on a hat and dozens of uses. 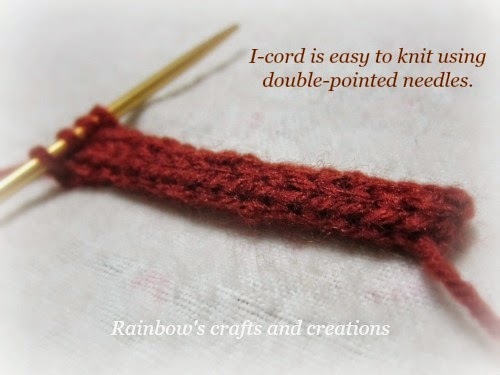 It is very easy and simple to make, what you need is two double-pointed needles and yarn. 1.Cast on several stitches (normally 3-6 stitches). 2. Do not turn your work to the back. Slide all the stitches along the right needle from the left to the right needle tip and then transfer this needle to your left hand. 3. Now, the end/tail of the working yarn is coming from the last stitch on the needle, it is seem that the tail is coming from the wrong end. Actually, it is right. 4. & 5. Pull the yarn across the back of the stitches and knit the next row. Make sure to pull the first stitch tightly. 6. Repeat step 2 to 5 until you have the I-cord of your desired length.